Just got back from a lovely vacation with family in Switzerland’s Val D’Anniviers. Driving the narrow roads with their 350o switchbacks — they’re the automotive equivalent to a ladder — is always thrilling and occasionally chilling. Especially if you don’t know the Hikers’ Code. A bunch of us hiked up Bella Tolla, a genuine Swiss mountain. It’s hard work for a hiker, if not dangerous or technically challenging for a genuine mountaineer. At the peak, 3025 metres above sea level, the air is thinner and you’re definitely tired from the exertion of the ascent. Anyway, afterward, my sister-in-law was descending a very steep section with her daughter. A couple of Swiss-German hikers were coming up the same path, so she stepped aside to let them pass. The man halted, looked her in the eye and, in extremely formal English, announced: “We give you thanks for your kindness in observing the Hikers’ Code — and bid you good-day.” Then they trundled upwards. Allow those ascending — they’re working harder and in the zone — to proceed unimpeded on the path. You step aside. 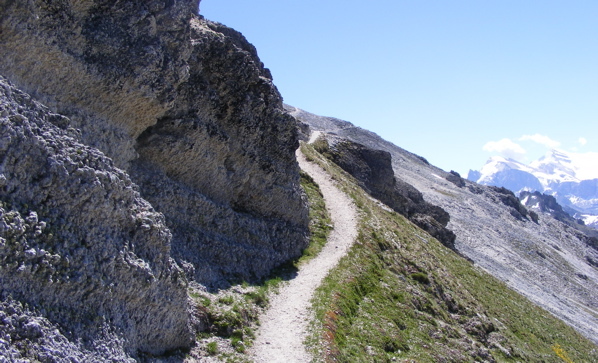 The same unwritten rule applies on the steep mountain roads, many of which are little wider than the hikers’ paths. I learned this the hard way, at the very point of one of those 3500 switchbacks. Bizarrely, there was no mirror for this tight corner though it dropped so steeply, you couldn’t see the roof of the bus or postal truck coming up just metres away while I came down. Until we met. Shifting into a lower gear, while turning fully around and practically supine is a complicated business on a turn that only accommodates a single vehicle. Fortunately the Hikers’ Code doesn’t entail honking and swearing at its violators. Though safe, I already felt embarrassed enough.